I have always been fascinated by meatloaf. To me, it’s the ultimate classic American dish. I’ve been working on adapting one of my favorite meatloaf recipes into a slow cooker meatloaf and I can’t wait to share. Cooking a meatloaf in the slow cooker is really the way to go. The slow cooker environment keep the meat moist and tender. 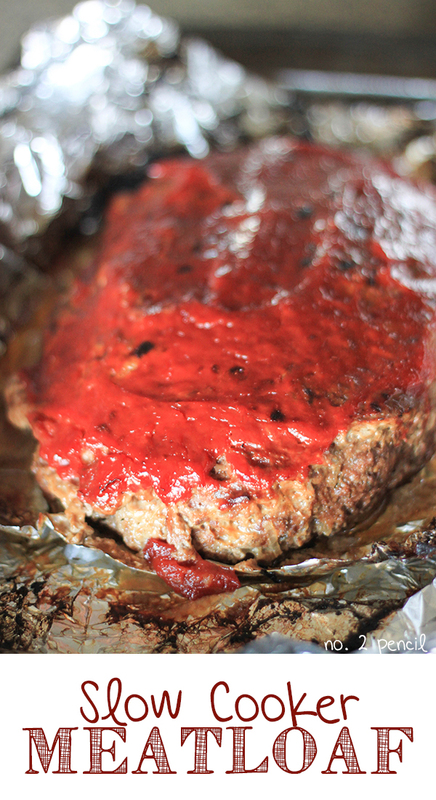 This meatloaf is so flavorful, forget weeknight meals. This is company worthy meatloaf! This was my first recipe with my new slow cooker , and let me just say I am completely impressed. It has a probe thermometer that automatically switches to warm mode when the dish reaches the desired cooking temperature. Technology has come a long way since I got my old trusty slow cooker 12 years ago. Let’s get started on our slow cooker meatloaf. 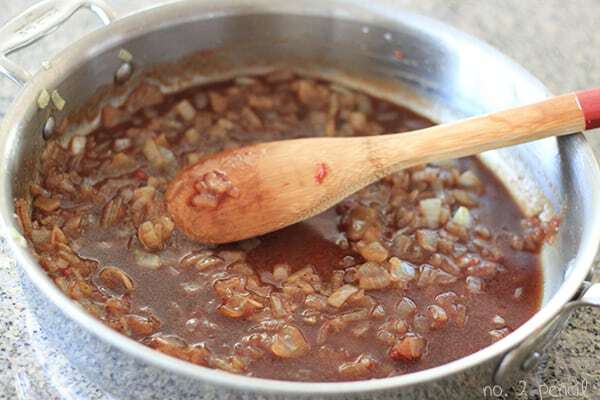 Start by cooking the onions over medium low heat. You don’t want to brown them, just get them nice and soft. Add salt and pepper. I don’t measure the pepper, I just keep cranking the peppermill until it looks good. Stir in chicken broth, tomato paste, and soy sauce. You aren’t going to taste the soy sauce, it just beefs up the flavor of the meat. 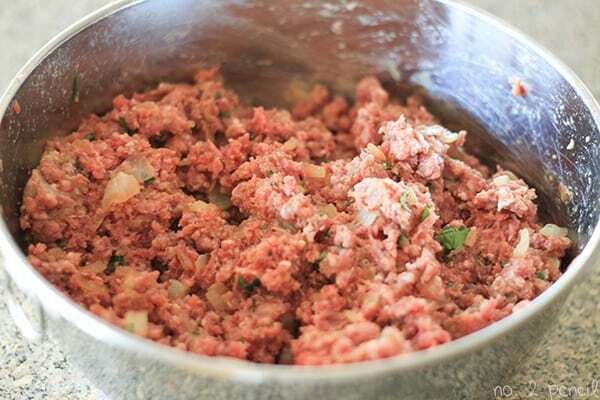 In a large bowl, combine ground beef, onion mixture, egg, bread crumbs, and parsley. Use a fork to gently mix the ingredients. You don’t want to overwork the mixture. If you keep stirring, the meat will continue to break down and the meatloaf mixture will be very dense. Now the meatloaf mixture is ready to go. Let’s prepare the slow cooker. Lay out three large sheets of foil, overlapping each other. Line the slow cooker and fold down the sides. These will be handles so you can lift the meatloaf out later for slicing. Lightly shape meat mixture into a loaf. Pour ketchup over the top. Here is my new slow cooker in action. I inserted the probe and programmed the slow cooker to cook on low until the thermometer reaches 160 degrees. I cannot wait to use this to cook a whole chicken! It’s perfect, no guessing if the meat is done. Here is the meatloaf after about 4 hours on low. Perfectly moist and ready to be served. I lifted the meatloaf out using the foil handles. While I was lifting the meatloaf, I turned down one of the edges of the foil and poured off the excess fat. This meatloaf can go right from the slow cooker to the table, but for a little extra finish, you can run it under the broiler for about 5 minutes until the ketchup starts to caramelize. Serve with additional ketchup and mashed potatoes. Pour olive oil in a sauté pan and cook unions until soft and translucent over medium low heat. You don't want them to start browning. Add salt and pepper to the onions. Stir in chicken broth, soy sauce, and tomato paste. 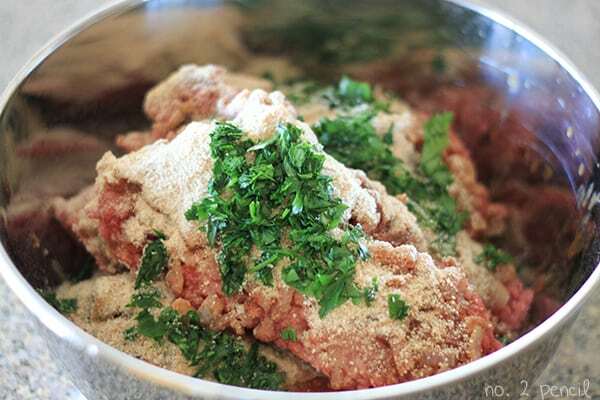 In a large bowl, combine meat, onion mixture, parsley, eggs, and breadcrumbs. Use a fork to gently combine. Don't overwork the meat mixture as this will make the meatloaf dense. 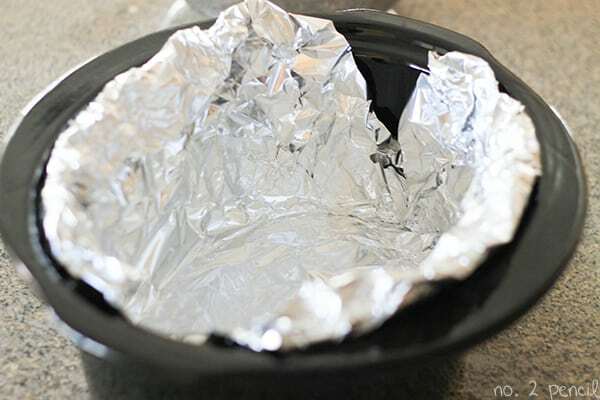 Use three sheets of foil laid over each other to line the slower cooker. 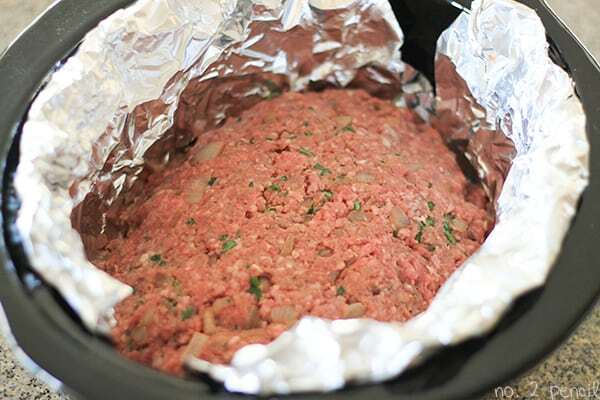 Fold sides of foil down to create handles you can use to remove the meatloaf from the slow cooker. Place meatloaf mixture into slow cooker and form into loaf shape. Pour ketchup over the top. Cook meatloaf until it reaches 160 degrees. About 4 hours on low. 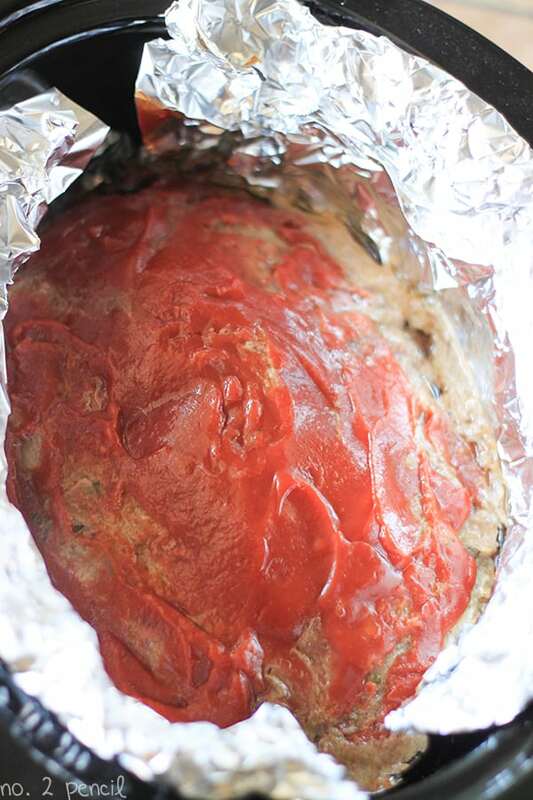 Once meatloaf is cooked, remove from slow cooker using the handles of the foil. 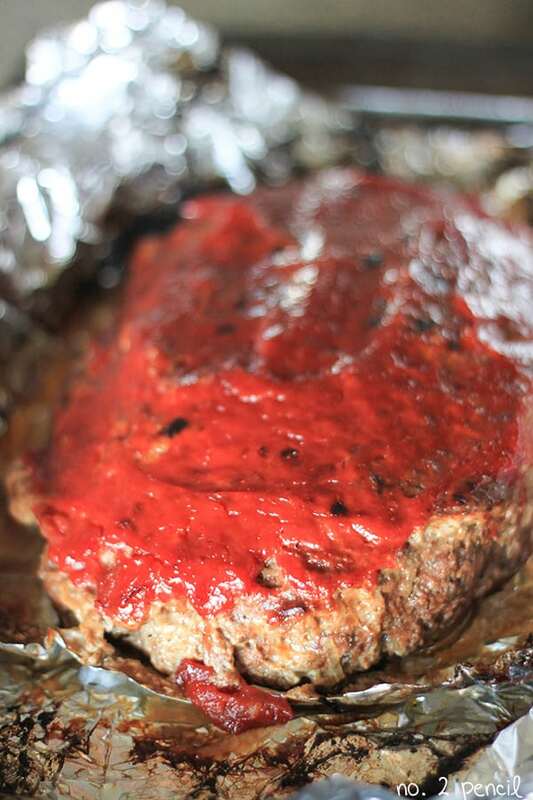 Optional : You can place the meatloaf under the broiler for about 5 minutes to caramelize the ketchup. Adapted from Ina Garten’s Meat Loaf Recipe A long time favorite! 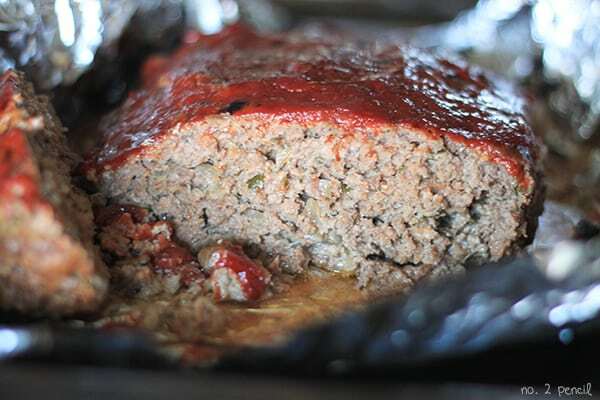 I like this meatloaf recipe and method very much. Thank you. The Slow Cooker is wonderful for many things but your recipe for whole lemon chicken (also referenced here) is not good for me. It comes out much too soft with an unpleasant texture. I followed your recipe exactly, but obviously it was overdone. Maybe if I used your new cooker with the thermometer it would have been edible. Picturing the cooker in action you say it is programmed to cook on high. But in step 12 of instructions its on low. Just a little clarification needed please. Thank you. It looks delicious. You have flaws in your directions. Nowhere do u say to add the meat the anything. I’m guessing after the breadcrumb and eggs are added to onion mix THEN meat is added? Please fix . I’ve updated the recipe! Thanks for the comment. I use BBQ sauce instead of ketchup and crushed crackers instead of bread crumbs and its so yummy. I have that slow cooker. You aren’t supposed to use the clasps around the top unless you are transporting something. It was a surprise to read that in the instruction book! Thanks for the tip! I did not know either! I work, this I need something to cook for 8-10 hours, plus I’m serving for 9. I’ve altered the recipe considerably. I’m prepping the night before, freezing the uncooked meatloaf. I’ll drop in the block of seasoned meat in the slow cooker tomorrow. If it all works out, I’ll post my recipe. I’m starting out with 5 pounds (2 packages) of Smart Cuisine natural Meatloaf & Meatball Mix (purchased at BJ’s). It’s a mix of ground beef, pork and veal. if your cooking the meatloaf for 4 hours on low do you really have to precook the onions for the same effect? 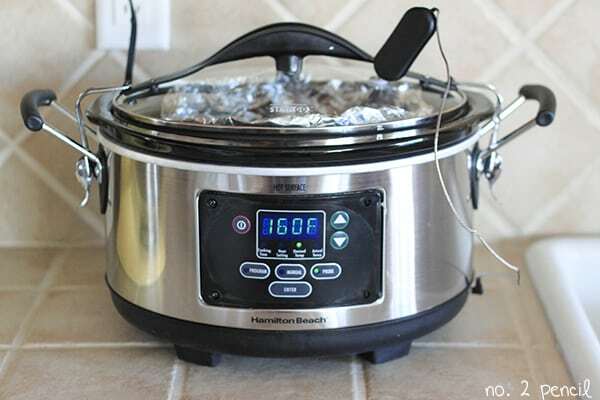 sorry if this is a stupid question i tried crock pot cooking years ago and failed so i put it away for many years and only now i am ready to give it a try again. and what if i stuck chunks of monterey jack cheese in the meatloaf. do you think it would just melt all around or would there be a pockets of cheese? 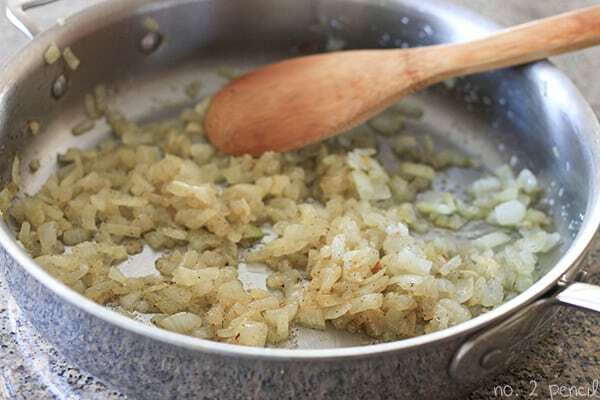 Yes, you do need to sauté the onions so they won’t be crunchy. I think I would try shredded cheese! I would mix some brown sugar, molasses/worcestershire with the ketchup for a sweeter taste.